Bill Bradshaw, a Lewiston, NY native, and a graduate of the former Bishop Duffy High School in Niagara Falls, was an All-American baseball player at LaSalle University (’69). Bradshaw did not miss an inning at second base during his sophomore through senior seasons. One of the top middle infielders in the country, Bradshaw set school records in many categories. As a senior, he was second in the nation in RBIs (35), fourth in stolen bases (22) and ninth in batting average (.415). During his three-year career, he held a .360 batting average. Bradshaw played professional baseball in the Washington Senators organization for two years before suffering a pair of broken ankles and returning to Western New York. He also played semi-professional baseball in the Western New York area for five years. As a captain and starting shortstop for the Sloan Bruins, Bradshaw helped lead the squad to the 1970 National Amateur Baseball Federation Championship. He also served as the manager of the 1971 Wheatfield Post team that won the New York State American Legion championship. He then accepted the position as baseball coach at Niagara University (1972-74), setting a record for total wins over the two year tenure. From playing and coaching, Bill transitioned into athletic administration. An NCAA Division I athletic director for 38 years, Bradshaw has led the programs at LaSalle (1978-86 & 2016-present), DePaul (1986-2002) and Temple (2002-13). 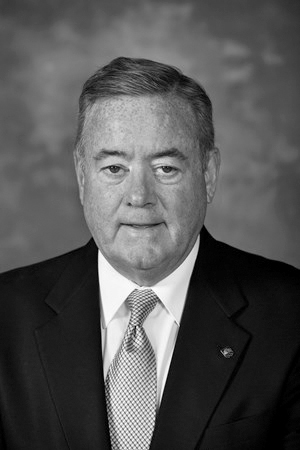 Some of his notable achievements include being named the Football Bowl Subdivision (FBS) Athletic Director of the Year in 2011, receiving the General Robert R. Neyland Award for Athletic Directors from the All-American Football Foundation (1998) and serving as President of the National Association of College Directors of Athletics (NACDA) in 2001-02. During his first stint at LaSalle, Bradshaw’s teams won 28 conference championships and received three men’s basketball and two women’s basketball NCAA Tournament bids. At DePaul, he was instrumental in forming the Great Midwest Conference, was tournament director for two NCAA men’s basketball opening round tournaments and guided the Blue Demons to record revenues, all-time attendance records and to a combined 13 men‘s and women’s basketball NCAA Tournament bids. With Temple, he steered the resurrection of the Owls football program, oversaw construction of basketball and football complexes and took their program through two conference changes. The Owls participated in three consecutive FBS football bowls, as well as eight straight women’s and six straight men’s NCAA Division I basketball tournaments. For his career, his basketball programs have totaled 32 NCAA Division I men’s and women’s basketball tournament appearances at three different institutions. Bradshaw is a member of the LaSalle Hall of Athletes (1995), the Western New York Baseball Hall of Fame (2003), Niagara Catholic Hall of Fame (2006), the Niagara Falls Sports Hall of Fame (2008) and the NACDA Hall of Fame (2014).